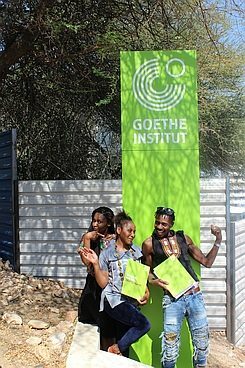 © Goethe-Institut The Goethe-Institut Namibia is known for promoting cultural engagement by fostering dialogue through the Arts and is through Goethe Stage seeking new and local art projects. Are you a young Namibian artist or a group of artists in pursuit of a project relevant to your community or country and need financial assistance? Then we’d like to hear about your ideas and support your project. Goethe Stage assists local artists of any discipline in their creative pursuit of one project. Download the Goethe Stage Guidelines and Goethe Stage Application. Submit your application as soon as possible. Please read carefully for information, guidelines and rules. 30. April - 30 May. 30. July - 20 August. Successful candidates will be contacted two weeks after closing date. GOETHE STAGE 2018 PHASE 3 AWARDED! After weeks of deliberation, the independent jury selected three artists they think are set contribute to the cultural development in Namibia. No discipline is favoured. ©Goethe-Institut Namibia Theatre Sports League at old-age homes by Luktos Shikongo – The Katutura Old-Age Home is to be livelier with a splash of theatre sports that is all about improvisation and involving the audience. Persons living at old-age homes are often perceived as neglected and the goal of this project is to challenge that stereotype by involving the elderly and entertaining them at once. Fluidity by Jean-Louis Knouwds and Justina Andreas – The aim of this dance show is multifaceted but grounded on challenging the stereotypes of gender roles. The fluidity of the transition between masculinity and femininity is expressed through the different styles of dance and the dramatic costumes further accentuate the show’s theme. Basic textile design by Elizabeth Shinana – The Frans Mbinga Art Centre at the Havana informal settlement will later this year offer a four-day course for children and adults on the basics of textile design. With a focus on understanding fabrics and repeating patterns, the workshop will also introduce participants to the tools required for the production of simple stencil and free-hand painting.